When my life long friend H found out in January that she was having a little boy, I told her that I wanted to knit him a blanket. That evening, I went to the craft store and bought yarn. I picked out a new pattern to try and knew the supplies that were needed. I opted to try a new adventure. A knitting buddy finally convinced me to try a diagonal blanket using circular needles. I quickly fell in love. Before I knew it, the baby blanket was complete and ready long before the baby shower. Much to my surprise, my two young boys were quite jealous of this soft blanket and wanted me to knit something for them. Once again, I went to get supplies to make a family blanket. I knew the yarn I wanted, but they did not have nearly enough in the dye lot. I got a little more creative and opted to try the diagonal pattern using stripes. So every 25 rows, I switched from the Sunny Days yarn to dark blue. Here are some photos from the last 3 months. Thanks to trips to Disney, business, illness, school hoopla, and more – it took 3 months to knit the entire family sized blanket. Now the blanket is knitted and I need to weave in the ends. I was shocked to see that the blanket almost fits across my entire queen sized bed. Next up, I am going to use the yarn that I had bought for a Log Cabin blanket to make another lighter and larger diagonal blanket. Be sure to let me know what project you are working on right now. I’m always looking for more ideas to add to my list. I am so impressed with your knitting! 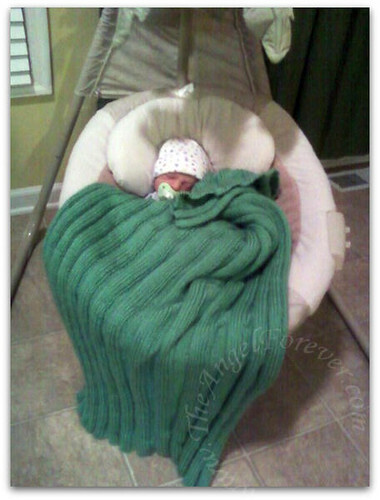 Love your blankets (and that sweet baby too).